Welcome Master Masons wishing to take the Scottish Rite degrees. Please download and print the petition (left) or pick up a petition outside the Scottish Rite office, ground floor, Boughton Memorial Hall on Fort Leavenworth. A check for $200. 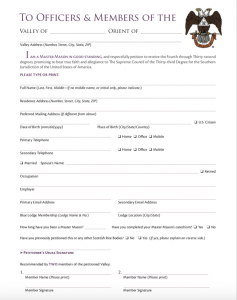 This fee covers your initiation, first year’s dues, your study materials, and all the accouterments that will identify you as a 32º Scottish Rite Mason. • A commitment that you will attend all sessions of the Reunion: Thursday evening, April 11, 2019, Friday evening, April 12, and all day Saturday, April 13, including the culminating dinner on Saturday evening, April 13, 2019.